I grew up on a steady diet of Dr Who and Star Trek and these shows fuelled what would turn out to be a lifelong fascination with space. I would read anything Astronomy related that I could get my hands on. I can remember when I first realised that the stars in the night sky were just suns like our own. Did that mean they had planets like Earth orbiting them? Could there be Vulcans or Klingons out there looking back at me? If only. We now know that there are thousands of known planets orbiting distant stars and while I’ve given up on meeting Spock, I can’t accept we are alone in the vastness of the cosmos. I still get that sense of childlike excitement each time I look skyward on a clear night. It’s hard to escape that feeling that somewhere out there there is a being staring up at our star and thinking the exact same thing. This is a golden era of space exploration and we are privileged to live through it. In my lifetime there have been some incredible achievements. I was just an infant when Neil Armstrong took that “one small step,” but there has been plenty to inspire and enthral me since. In particular the Voyager missions in the 70’s and 80’s had me gripped. The sight of such detailed images of the planets on TV and in the papers blew my mind. The colours, the distances involved and the details uncovered about their orbits, moons, atmospheres and temperatures made them more interesting than any fictional universe I had explored before. Back then of course Pluto was considered the Solar system’s ninth planet; a lone sentinel at the outer limits of the Suns influence. We knew it had a moon and a funny orbit, but we thought it was just a tiny snowball. Thankfully though science would never settle for the near perfect Voyager missions. 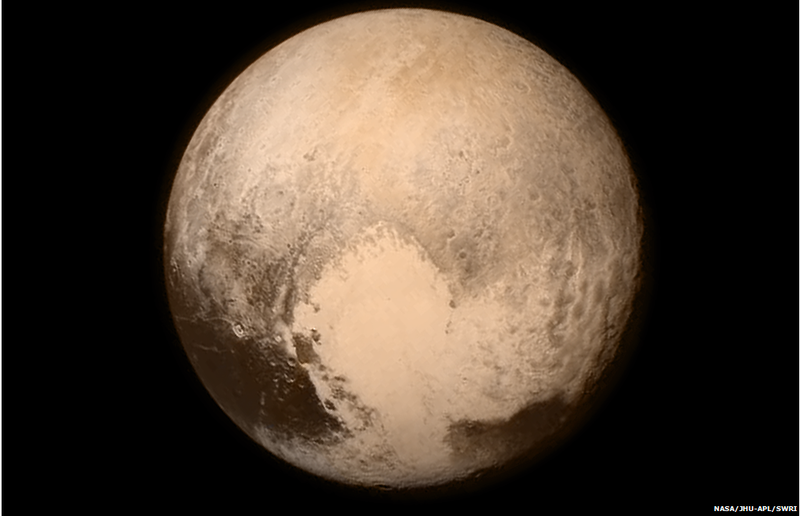 NASA may have missed out on Pluto over 30 years ago, but they would be back. 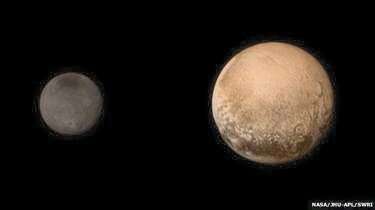 Sadly in the ten years that New Horizons has been hurtling towards our distant neighbour, at a mind boggling one million miles per day, Pluto has been stripped of its planetary status. We no longer have nine planets and school books and children’s rhymes have had to be rewritten. As strange as it may sound, I was actually quite disappointed by the move and I still can’t really explain why. However, there is at least some consolation in the fact that now, once again, we stand on the threshold of yet more exciting discoveries. New Horizons, a machine the size of a grand piano and powered by just enough energy to light a couple of electric bulbs has reached its destination. It’s been an unbelievable ride, clocking up an astonishing 3.6 billion miles. The science involved in getting there is staggering. When the craft blasted off a decade ago, the true nature of Pluto’s orbit wasn’t known and at one point there were serious concerns that the mission would miss its target completely. However, in an incredible feat of engineering, mathematics and science, New Horizons today rendezvoused with Pluto at a distance of just eight thousand miles from its surface. This is the cosmic equivalent of hitting a hole-in-one from New York to Los Angeles. Once again Science has brought human-kind closer to the heavens than any religion ever has. The discoveries being made today will change our understanding of how the solar system was made. It may even inform us as to how the Earth and ultimately ourselves came to be. In just a few hours we will be treated to the most amazing photographs of Pluto and its family of moons. Already we have discovered the planet is bigger than we had originally thought. In fact it is larger than any of the known objects in that region of space. It seems that, rather than demoting Pluto, astronomers have actually crowned it King of a new category of ‘Dwarf Planets’. It turns out these objects are by far the most populous. Already we know of ten and there is good reason to believe that there are hundreds, maybe thousands of them in the far reaches of the solar system. Science is constantly rewriting our understanding of the Universe, and it is likely that one day we will find an object bigger than Pluto, but for now it rightly basks in its new found status. There is though an even greater cultural significance to this mission. Think of that decade long journey. Consider the vast distances covered and then imagine yourself on that ship. Close your eyes for just a second and picture what the Earth would look like from that distance. How petty would our quarrels and concerns seem, when blessed with that degree of perspective? While the worlds nations and religions compete for some illusory superiority; they would do well to reflect upon this fundamental lesson and what it teaches us about our place in the cosmos.